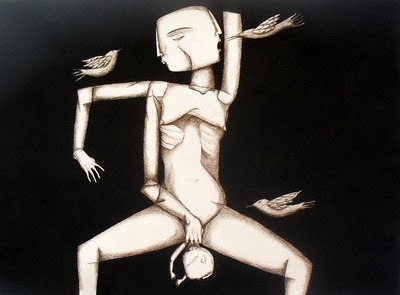 In this pen and ink micron 8 on watercolor paper, contemporary artist Magaly Ohika depicts a birthing mother whose baby descends peacefully from within her body. There is a movement to the work, two different profiles emerging from the woman’s face and multiple arms extending from her torso, suggesting that the woman is turning as she births and receives her baby. In one profile, her head tilts downwards, eyes and lips closed softly. In the other, her head lifts upwards, mouth open as if to receive breath and nourishment from the beak of a nearby bird. Two other birds join this one, forming a protective trinity around the woman’s body. Magaly Ohika’s academic and professional backgrounds are in illustration and toy design. She may be reached through email at: Ohika_mp@yahoo.com. Her artwork may be viewed or purchased through her Etsy shop.